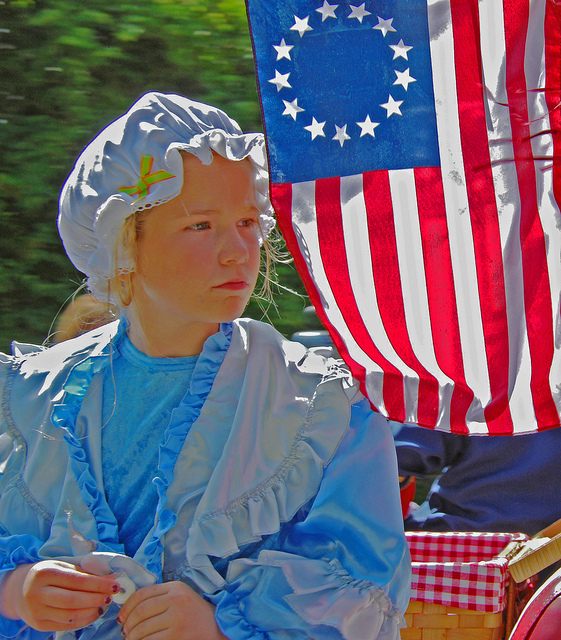 When I was ten years old, I got to dress up as Betsy Ross and ride on a big “Happy Birthday, America” float in our local community’s Bicentennial parade. I no longer remember the reason I was chosen for that honor—straight-A report card or Dork of the Week or whatever—but I remember the experience. I was proud, super proud, to represent all that was good and right about my homeland. Growing up in these United States, I would often hear scary stories about Russia and China and Cuba, and how the governments in those countries suppressed truth and presented only twisted propaganda to their populace. I would shake my head and feel sorry for all the people not fortunate enough to be living in a great free country like I was. In school, I studied American history and felt reverence for our forefathers who laid down their lives for the right to speak their minds, even when their ideas weren’t popular. Today, my heart is aching for the world that was. In other words, let’s censor the Internet! No more debate about climate change or vaccine safety or Russian hackers. The official government-approved statement on all of these is out, and you will accept it. Then add to that, just last week, a Tweet by CNN anchor Chris Cuomo echoing a similar sentiment, as he informed us (incorrectly) that it would be illegal for any of us peons to read the Clinton/Podesta leaked emails, but it was just fine and dandy for our esteemed press corps to do it, and then pass their sanitized version of the truth on to us. Republican, Democrat, Libertarian, or Independent, I hope you are as appalled by these attitudes as I am. The idea that citizens of the United States should not be free to express or consume any information we choose is as un-American as it gets. The words “unmitigated gall” come to mind, but for now, let’s just call it Orwellian. Do I look like a three year old who just asked where babies come from? Sorry, my self-proclaimed intellectual leaders, but I am an adult, and a highly educated one at that. But in the Land of the Free and the Home of the Brave, I don’t have to be, to be allowed to make my own decisions. Maybe I’m an idiot. Maybe I’ll make bad ones. Maybe my choices will turn out to be horrendous mistakes, but they’re my mistakes to make. I don’t need you or anyone else to “curate” my information sources, thank you. I’ll decide who to listen to and who to ignore…and that might be you! The Wild, Wild West of the free and open Internet is the best thing that ever happened to this country and the whole world. We can read a thousand differing opinions on each of a million different topics. Is some of it wrong? Is some of it potentially hurtful? Is some of it downright comedic? You betcha. But I’ll figure that out myself and glad to do it. We understand why you want to quiet dissenters, bury unpleasant truths, and spin reality like a centrifuge; it’s not exactly a new tactic, guys (see earlier remarks about Russia and China). There’s a reason we’re all turning our backs on CNN and MSNBC and The New York Times. Shuck the agenda, stamp out the spin, and give us the facts, if you want a rat’s chance of survival. And while I’m on my soapbox: Long live the America I grew up in, where liberty and individuality were celebrated, not squashed, and where we were reminded daily that while we might find others’ ideas offensive, our freedom to speak our minds depended on us tolerating the same from everyone else. Three cheers for the First Amendment!